Heli-skiing is off-trail, downhill skiing or snowboarding reached by helicopter, instead of a ski lift. In the late 1950s helicopters were used in Alaska and Europe to access remote terrain. In 1965 Hans Gmoser commercialized the activity in Canada by combining lodging, transport and guiding. In Switzerland there are an estimated 15,000 heliskiing flights each year, to 42 landing sites. In 2010 Switzerland's major environmental groups, including the Worldwide Fund for Nature, handed a petition with over 15,000 signatures to the Swiss government, demanding a ban on heliskiing. Heliskiing is banned in Germany and was banned in France in 1985. Austria allows two landing sites. ^ Donahue, Topher (2008). Bugaboo dreams : a story of skiers, helicopters and mountains. Rocky Mountain Books. ISBN 9781771600224. Retrieved 14 July 2015. ^ Foulkes, Imogen. "Pressure grows on Swiss heliskiing". BBC. Retrieved 10 July 2014. ^ "Is Heliskiing illegal in France?". 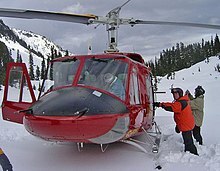 www.heliski.co.uk. Retrieved 2019-03-13.